This morning Pope Benedict XVI received the new Ambassador of Great Britain to the Holy See, Nigel Marcus Baker in an audeince where the new ambassador presented his credentials to the Pope. 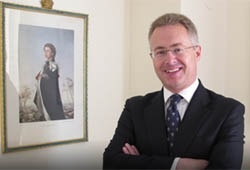 Ambassador Nigel Marcus Baker, 45, succeeds Francis Campbell who moved after a term of service to the Holy See to another post. The new ambassador has worked with his country’s diplomatic service in Central Europe and in South America; recently he was in Bolivia. Baker has worked in the Private Office of Prince Charles and for two years lived and studied in Italy. He’s married and has one son. When policies do not presume or promote objective values, the resulting moral relativism, instead of leading to a society that is free, fair, just and compassionate, tends instead to produce frustration, despair, selfishness and a disregard for the life and liberty of others. Policy makers are therefore right to look urgently for ways to uphold excellence in education, to promote social opportunity and economic mobility, to examine ways to favour long-term employment and to spread wealth much more fairly and broadly throughout society. Moreover, the active fostering of the essential values of a healthy society, through the defence of life and of the family, the sound moral education of the young, and a fraternal regard for the poor and the weak, will surely help to rebuild a positive sense of one’s duty, in charity, towards friends and strangers alike in the local community. The sustainable development of the world’s poorer peoples through well-targeted assistance remains a worthy goal, since the peoples of developing countries are our brothers and sisters, of equal dignity and worth and deserving of our respect in every way, and such assistance should always aim to improve their lives and their economic prospects. As you know, development is also of benefit to donor countries, not only through the creation of economic markets, but also through the fostering of mutual respect, solidarity, and above all peace through prosperity for all the world’s peoples. Promoting models of development which employ modern knowledge to husband natural resources will also have the benefit of better protecting the environment for emerging and developed countries alike. Watch a video presentation of the visit.